Furnished rooms and executive apartments. Walking distance to restaurants, bars, and entertainment. Housekeeping, cable TV, utilities included. Extended Stay Lodging by the Month hotel rooms are fully furnished and affordable. Extended stay rental is $800 per month single occupancy. Double occupancy extended stay monthly rental is $900. The extended stay lodging rates include all utilities, taxes and weekly maid service. Extended stay hotel rooms measure 250 square feet and are fully furnished and tastefully appointed. A restful night’s sleep is assured atop Spring Air’s finest luxury king sized mattress. Accommodations with two queen beds are also available. Extended stay rates include wireless internet service, and flat screen television with basic cable service. Extended stay rooms are equipped with a combination tub and shower, dresser, night stand, desk table with arm chair, flat screen television, individually controlled heat and air conditioning, compact refrigerator with freezer section, and microwave. You are welcome to bring in your own coffee maker, however, items that can cause a fire such as hot plates, toaster ovens, toasters and candles are not allowed. Lodging by the Month was created for anyone needing Extended Stay Monthly. Relocation services confidently refer their clients for their extended stay needs. We specialize in long term accommodations for anyone on extended business travel or temporary job assignments. Realtors familiar with historic downtown Plymouth know their clients will be staying just steps away from several restaurants, numerous boutique shops, tree lined Kellogg Park and the Penn Theater. Extended stay guests will feel they are part of the community from the moment they check in. Whether you are visiting relatives, relocating to a new job, remodeling or buying a new residence, the “home away from home” experience provided by Lodging by the Month, is what our guests appreciate so much. For instance, all summer long, our long term hotel guests enjoy Thursday night Plymouth Symphony concerts under the stars. “Music in the Air” concerts are held in Kellogg Park on Friday nights Memorial Day thru Labor Day at 7:00 p.m. In January, Plymouth hosts the Ice Sculpture Spectacular featuring world renowned ice carvers from as far away as Japan. In July, Art in the Park fills the streets with over 400 artisans and their unique hand crafted works of art. In September, the Fall Festival is a four day food and craft fair hosted by all the service clubs with the Rotary Club hosting the tastiest finale on Sunday with a sell-out barbeque dinner, with over10,000 chickens grilled over two 100 foot long smoking charcoal pits. On Halloween eve, goblins descend upon the downtown for treats from all of the participating merchants, Thanksgiving and Christmas are celebrated in Kellogg Park. Just 20 minutes to Detroit Metro Airport, University of Michigan and Saint Joe Hospital. Just around the corner from neighboring Kellogg Park. Numerous local festivals & music activities. Saturday Farmer’s Market a block away. Centrally located with easy I-275, M-14 and I-96 expressway access, convenient to and from Ann Arbor, Northville, Novi, Canton, Farmington, Dearborn, Westland and Livonia. Extended Lodging by the Month is licensed and insured. When you are in the metro Detroit area, please feel free to call or stop in the office Monday - Thursday 9:30 A.M. - 5:00 P.M., Friday and Saturday 11:00 A.M. – 4:00 P.M. Monthly rates are a fraction of the price of Michigan extended stay properties such as Residence Inn Hotels or Extended Stay America. 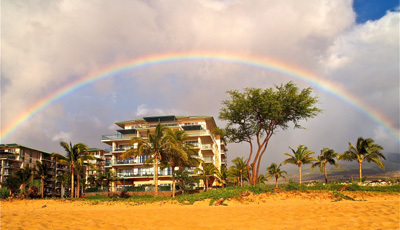 Spectacular ocean view seventh floor one bedroom one bath unit #738 on the preferred north side of the Hokulani tower. Wake each morning to stunning ocean views from your king-size bed and spacious lanai. Floor to ceiling "nano" door wall runs the entire width of the living area bringing the outside in along with tropical breezes for a true Hawaiian experience. Owned and operated by Mary and Randy.